In the late summer of 1777, the British master plan to sever New England from the rest of the rebellious American colonies had come unhinged, leaving John Burgoyne's Northern Army dangerously isolated. In an attempt to break through American defences to reach Albany, New York, Burgoyne launched his army at the American defences on Bemis Heights. An American force dispatched by Benedict Arnold clashed with the British advance in deep woods, triggering an afternoon-long fight fed by reinforcements for both sides. The battle ended in stalemate, as good as a defeat for Burgoyne, but might have tipped in his favour. Saratoga uses the simplified QuickPlay version of the Musket & Saber system of warfare during the muzzle-loading era. Combat is based on unit quality rather than raw numbers, and rewards use of historical tactics. All units are susceptible to rout when weakened, so players must maintain reserves. Leaders enhance unit capabilities. 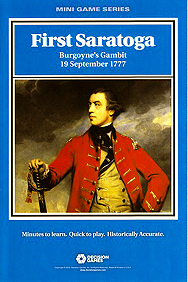 Special rules cover the characteristics of eighteenth century warfare, especially the emergence of light infantry, and the differences between regulars and militia. Winning the battle depends on deployment, thoughtful manoeuvre to concentrate at the key points, the proper coordination of arms, careful use of leaders and special units, and an understanding of the strengths and weaknesses of each army.